Unusually colored vegetables can be a bit of a disappointment. When I worked on a farm in Vermont, I brought home a bushel full of those purple and Dragon's Tongue "green" beans and planned what I thought would be a variegated bean salad, only to find that they turn to regular ol' green beans once cooked. Purple "tie-dye" carrots similarly lose their color once heat is applied. Not so, though, with purple/blue potatoes. Their hue persists, even intensifies, when sautéed or baked. We had a lot of them growing up--my Indiana potato farmer uncle would bring them, usually roasted, to Thanksgiving and Christmas dinners, adding a colorful novelty to an otherwise beige meal. A few weeks ago I had coffee with Stephanie Breijo, the Associate Editor and talented photographer (she took all of these beauteous photos) of Brightest Young Things and she asked if I was interested in providing baked goods for and collaborating on a DC Urban Picnic Guide. With eating en plein air being one of my favorite ways to pass the time, I agreed. In planning the menu, I needed portable, picnic-conducive items that would be both delicious and photogenic. 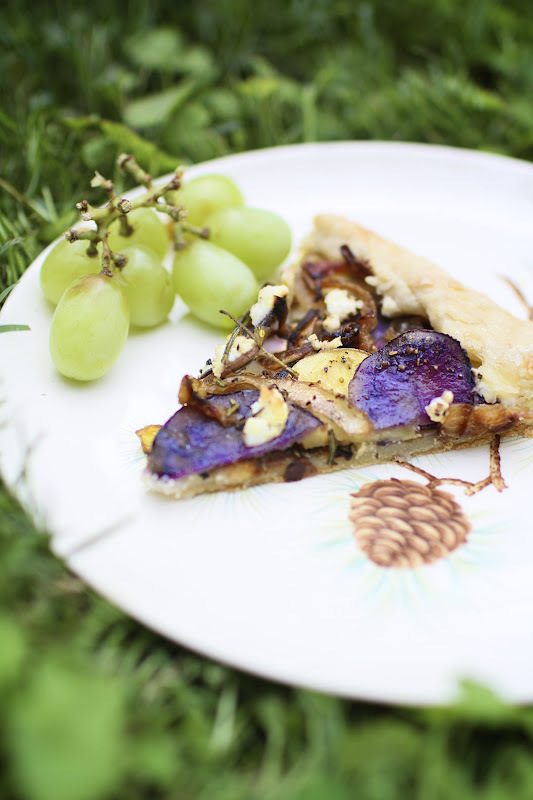 I also definitely wanted to include a substantial savory tart, for a real picnic ain't just sweets. Re-enter then the purple potato, with its royal purple tint, reminding me of one of my favorite quotes in The Wicker Man, "Some things in their natural state have the most VIVID colors." 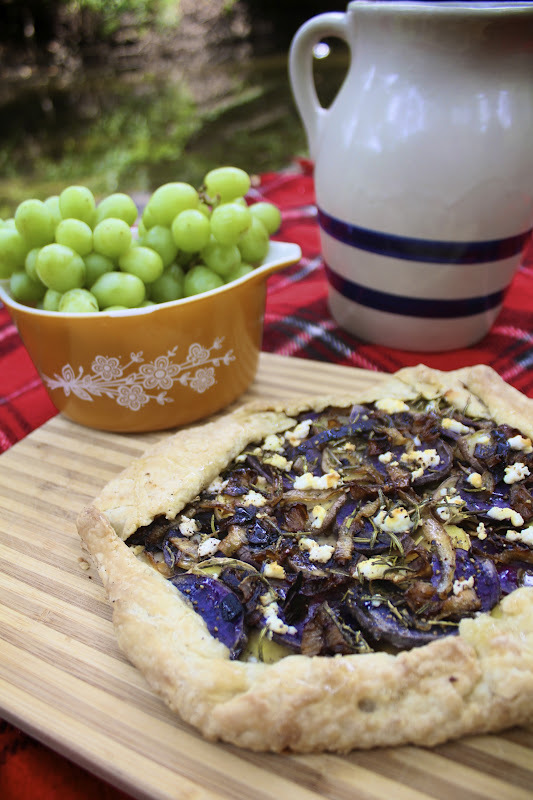 Rosemary and caramelized onions are natural 'tater companions and my cheesemonger housemate Mary recommended the addition of goat cheese, for complementary flavor and color. Then I threw in a few other potato varieties for a tri-color potato, caramelized onion, goat cheese and rosemary savory galette. 1. Prepare half of the Nothing-in-the-House pie crust as per the directions but leaving out the sugar. Chill dough at least 1 hour before rolling out into a 10-11 inch circle on a sheet of parchment paper. Put the rolled crust back in the fridge while you prepare the filling. 2. Preheat the oven to 375 degrees F. Add 1 Tblsp. olive oil and sliced onions to a cast iron skillet and place over medium heat. Stir to coat onions with olive oil. Cook the onions, stirring occasionally, until translucent. Sprinkle onions with salt and pepper and reduce heat to medium-low. Cook 25-30 more minutes until onions are caramelized. 3. While the onions are cooking, thinly slice the potatoes in rounds. Place the rounds on paper towels to let them dry slightly. 4. Remove rolled crust from the fridge and brush the bottom with 1/2 Tblsp. olive oil. Place the potato slices in concentric circles over the crust, leaving a 1-inch edge and scatter the caramelized onion slices on top. Sprinkle the goat cheese and rosemary evenly over the potatoes and onions. Fold the edge of the crust over the top of the filling and seal. Drizzle remaining 1/2 Tblsp. of olive oil over the entire tart and sprinkle a dash of salt and pepper over top. 5. Bake tart for 35-40 minutes or until crust is golden brown and potatoes are cooked through and almost crispy. Enjoy on a woodland picnic or 'round your kitchen table. The day of the photoshoot had us trekking to DC's most beautiful and romantique spots--Malcolm X Park, where I assembled for protests in college and have since visited for Sunday Times reading and well, picnics; the Tidal Basin, just across the Potomac from the Jefferson Monument; and the Smithsonian Sculpture Garden. This galette was shot in Rock Creek Park, one of my favorite District locations (and closest to my home) with woods, fields, and trails perfect for running & biking, long walks, experimental sound installations among the ruins of the capitol building (it happened and it was incredible), and yes, snacking. 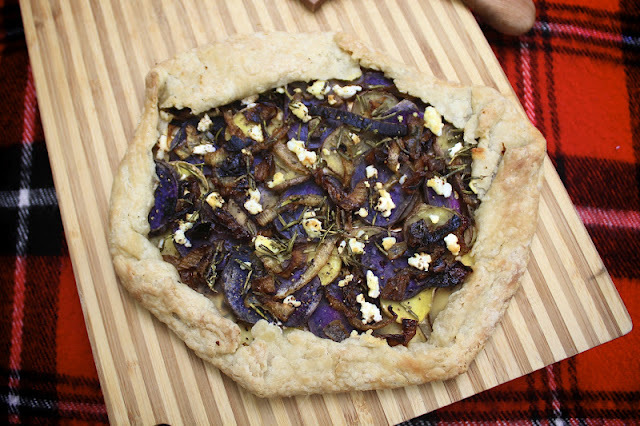 For after we were done snapping these photos, we turned this galette into lunch. P.S. I said it once, and I'll say it again--thanks to Stephanie Breijo for the amazing photos! Check out more of her work here. Labels: Caramelized Onion, Goat Cheese and Rosemary Galette, potato galette, savory galette, savory pie, savory tart, Tri-color Potato, Washington D.C.